neskaityta, bet ilgesnį laiką pragulėjo lentynoje. siunčiu į kitus miestus. Santrauka: Henry Page, the owner of "The Northern Light", the oldest and the most respected newspaper in Tynecastle, is offered a vast sum to turn over control to a mass-circulation group based in London. 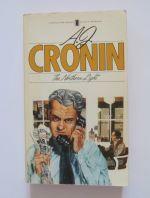 He refuses - despite entreaties by his wife to accept - and so begins his fight with the Chronicle, an almust defunct newspaper in the same area which is given new life by London thinking and London men... Master story-teller A.J.Cronin here gives us a story in the great tradition of "The Citadel". Komentaras: New English Library / Times Mirror. 222 psl.